This groundbreaking book reveals how different kinds of information overload impact workers and businesses as a whole. It helps businesses get a grip on the financial and human costs of e-mail overload and interruptions and details how working in an information overloaded environment impacts employee productivity, efficiency, and morale. Timely and thought-provoking, Overload! addresses the reality of?and solutions for?a problem to which no one is immune. Jonathan B. Spira is CEO and chief analyst of Basex, a research firm focusing on issues companies face in the knowledge economy. His points of view and commentary have appeared in Time, the New York Times, Business Week, and the Wall Street Journal. Mr. Spira is a founding board member of the Information Overload Research Group, an industry consortium. He is author of Managing the Knowledge Workforce: Understanding the Information Revolution That's Changing the Business World and coauthor of The History of Photography (named a best book of the year by the New York Times). Foreword Fighting the Good Fight against Information Bloat. The Age of the Knowledge Worker. Great Moments and Milestones in Information Overload History. Part I How We Got Here. Chapter 2 History of Information. The Information Revolution and the Book. After the Book … Getting the Word Out. Chapter 3 Welcome to the Information Age. Is Software Holding Us Back? Mid-Nineteenth-Century Tools: Groundwork Is Laid. Twentieth-Century Tools: The Foundation for the Information Revolution. Online Collaboration Makes Its Entrance. An Office for the Twenty-First Century. Chapter 4 What Is Information? How Information Is Going beyond Network and Storage Capabilities. Data Mining to the Rescue? Chapter 5 The Information Consumer. 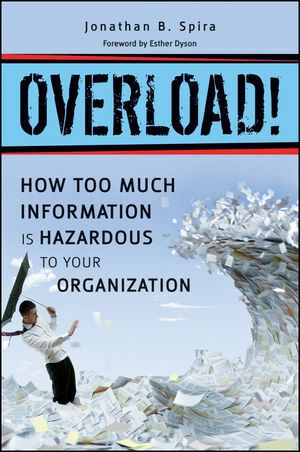 Chapter 6 What Is Information Overload? Meetings: Too Much of a Good Thing? More Information – Isn’t that What We Wanted? Information Overload and the Tragedy of the Commons. Chapter 7 The Cost of Information Overload. In Search of a Management Science. Chapter 8 What Hath Information Overload Wrought? Chapter 9 The Two Freds. Chapter 10 Beep. Beep. Beep..
How Much Texting Is Too Much? The Search for Whatever It Is We Are Looking For. Chapter 11 Heading for a Nervous Breakdown. The New Busy Is Heading for a Nervous Breakdown. Part II Where We Are and What We Can Do. Chapter 12 Managing Work and Workers in the Twenty-First Century. Chapter 13 Components of Information Overload. Unnecessary Interruptions and Recovery Time. Everything Is Urgent – and Important. The Cost of Too Much E-mail. E-mail and the Network Effect. Profanity in E-mail (Expletive Deleted). What to Do With 2.5 Billion E-mail Messages. Chapter 15 The Googlification of Search. Search and the Quest for the Perfect Dishwasher. Does the King of the Watusis Drive an Automobile? Quiet Time: A Time for Thought and Reflection. Chapter 18 Government Information Overload 203. The Consequences of Not Connecting the Dots. Chapter 19 The Financial Crisis and Information Overload. No Information Overload in 1907? Information Overload in the Market. Chapter 20 The Tech Industry and Information Overload. What Software Companies Are Doing. Chapter 21 What Works Better When. Social Software Tools in the Enterprise. What Should I Use When? 10 Tips to Help Lower Information Overload. Overload Stories: The Web Site.